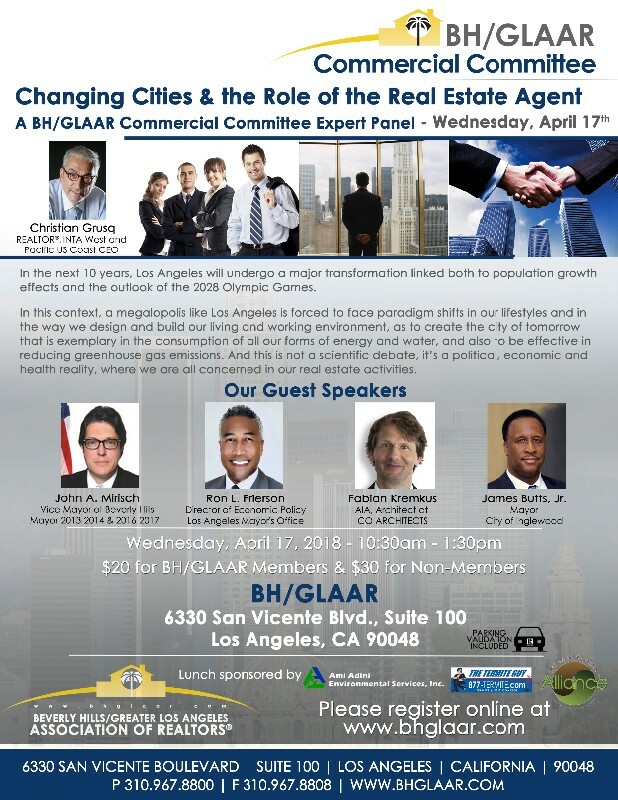 Changing Cities & the Role of the Real Estate Agent - A BH/GLAAR Commercial Committee Expert Panel - In the next 10 years, Los Angeles will undergo a major transformation linked both to population growth effects and the outlook of the 2028 Olympic Games. Thank you for visiting The Beverly Hills/Greater Los Angeles Association of REALTORS® ("BH/GLAAR") Members Portal. The term REALTOR® is a professional trade association designation and symbolizes the distinction between the average real estate licensee and a member of organized real estate. REALTORS® agree to adopt and abide by the National Association of REALTORS® Code of Ethics. The BH/GLAAR represents over 10,000 REALTOR® and AFFILIATE Members in the cities of Beverly Hills, Culver City, Los Angeles, Santa Monica, West Hollywood, and unincorporated areas of Los Angeles County.